Many of Gmail users including me today got a new feature with their gmail account. You can now import all your messages and contacts from any other webmail account like yahoo mail to your Gmail account. Here’s what the Gmail blog has to say about it. Now, with just a few clicks anyone can copy all of that to your Gmail account. It’s easy â€” just go to the Settings > Accounts & Import page and click “Import mail and contacts.” A window will pop out to lead you through the short import process. If you want us to continue to forward any new mail your other account gets for 30 days, we can do that too. Copying mail over usually takes a couple days, occasionally up to a week â€” but eventually it all arrives. And once it’s done, you can forget your old account and enjoy having everything in one place. 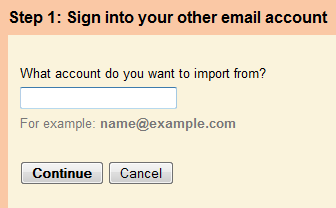 To start the Import process, you need to go to Settings > Accounts & Import page and click “Import mail and contacts. After you click on Import mail and contacts button, you will need to enter your other account details like the email address and then the password. Dont worry, your password is safe as its not stored on gmail server. Its secure and your password is deleted once the import process is over. The process may take from few hours to days depending on number of messages you are importing.